Break the eggs into a large mixing bowl. Add the milk, crème fraiche, salt and pepper and whisk until well combined. Cut the baguette in half, then cut it into quarters and finally into 1-inch cubes. Add the bread to the eggs and toss to combine. Leave to soak up the liquid for at least 10 minutes. Preheat the oven to 400ºF. Generously butter an 8-inch to 10-inch casserole or soufflé dish. 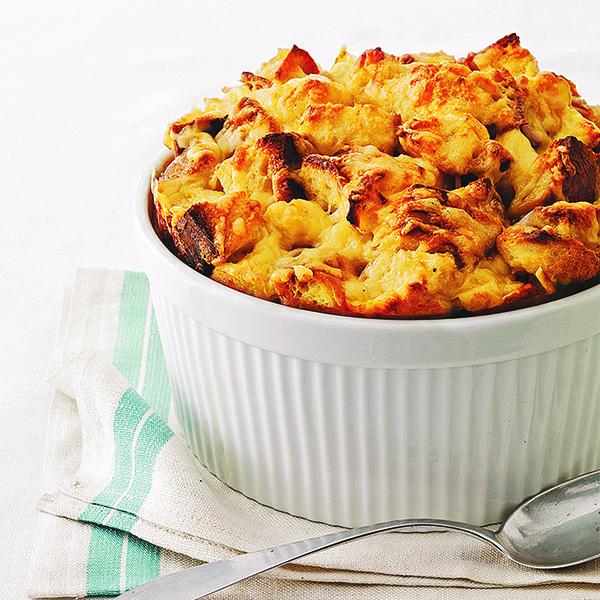 Transfer the a third of the soaked bread to the casserole and then sprinkle a quarter of the cheese on top. Repeat layering the bread and cheese until the casserole is filled. You should have 3 or 4 layers of bread and cheese. Pour any remaining egg mixture over the bread. Finish by sprinkling the remaining cheese in a thick layer on top. Transfer to the oven and bake for 30 to 40 minutes, until the bread pudding has puffed up in the center and the top is crusty and golden brown. Serve hot.